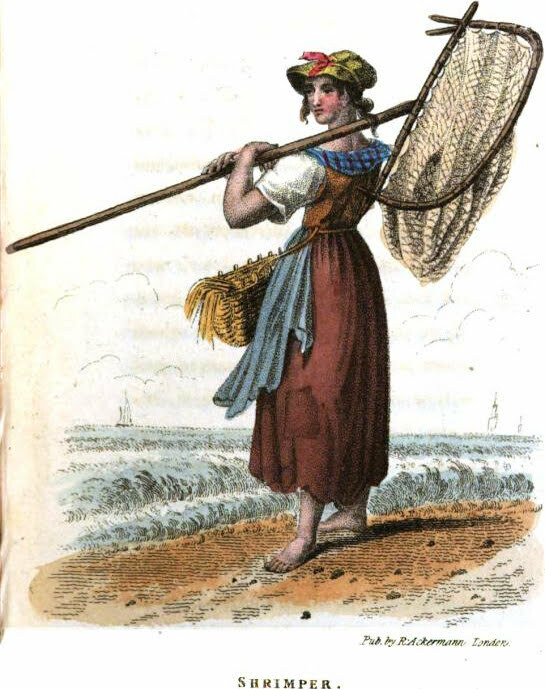 Mary Randolph's Virginia Housewife, first published in 1824, included many ice cream recipes - peach, vanilla, coffee, chocolate, cocoa nut, iced jelly, strawberry, raspberries, lemonade iced, citron melon, almond and... oyster. Standing in water for hours pushing their nets ahead of them in the sand, the picturesque Shrimpers captured the shrimp and/or prawns. When prepared, the shrimp formed "a delightful show, their brilliant red coats being garnished with green parsley." From Pyne's 1827 book. In a previous post - 7 years ago, (when this post was written, oops) - HERE, I discussed 19th century 'summer kitchens'. In the 18th century they were called 'out kitchens', or just 'kitchens'. The reason for the detached kitchens? - to keep homes "...more cool and Sweet" and "...because the Smell of hot Victuals, offensive in the hot Weather." Stew stoves - one of my favorite flue-zies - were described in a 1882 camping book. 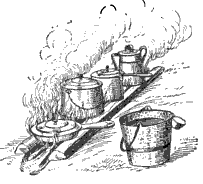 The image shows two green logs flattened along the top to securely place the pots and pans over coals from the main fire. Another camping book had illustrations of different pots and pans used to make ovens.